Congratulations to Yohei Kotsuchibashi of Kagoshima University for winning the Polymer Chemistry poster prize at the 6th International Symposium on Stimuli-Responsive Materials. The title of his winning poster was “Stimuli-Responsive Self-Assembly System That Can Form and Stabilize Nanoparticles at the Desired Size by Sample Mixing and Heating/Cooling of the Selected Block Copolymers”. 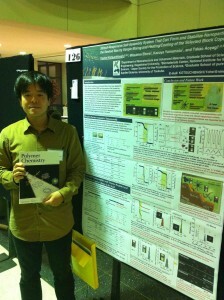 Yohei Kotsuchibashi works in Professor Takao Aoyagi’s group at Kagoshima University. The 6th International Symposium on Stimuli-Responsive Materials was held 26-27th October 2010 in Hattiesburg, USA. They have got developer vehicles together with trailers to transfer different types associated with items correctly as well as safely and securely to area cross country or a great deal place. speediest time frame this means you tend to be normally capped upward in addition to up-to-date around the competition. Obtaining how to get instagram followers july 2013 movie needs may improve your very own individual account to a different one diploma and still provide anyone a lot more credibility that may be suggestions corporation.